Hello, readers. This week is a special edition of Fire or Ice as we take a look back at the international break, as well as recapping the news. Let’s take a look at who is in the ‘Line Of Fire’ and ‘The Ice Zone’. This is a no-brainer. FIFA has recently released the report on corruption claims behind the World Cup 2018 and 2022 bids and cleared Russia and Qatar, while they also criticizing England for threatening the integrity of the bids. Of course, FIFA is investigating themselves over the bids and then have released the report to public. It’s great that they cleared the misunderstanding… not. 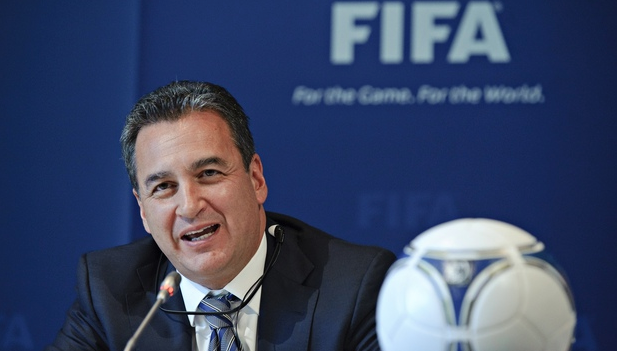 The lead investigator of the case, Michael Garcia, has appealed against the report he himself has written because the report wasn’t fully published by FIFA Ethics Chairman, Hans-Joachim Eckert. This has reinforced the suspicion that something shady is going on at FIFA. Allegations have been in existence since Russia and Qatar were awarded to host the next two World Cups. This is far from over. Can’t believe that ten years ago, Greece stunned the football world when they won Euro 2004. Present day, however, they have sunk to a new low when they lost 1-0 to Faroe Islands, leaving them at the bottom of their group and with a huge uphill task to qualify for Euro 2016. Unsurprisingly, Claudio Ranieri was sacked a day after the defeat, just a few months in his tenure with a record of three defeats in four games. And defeat to Serbia 2-0 did not make it any better for Greece. They have a lot to do to get back on track. Going down under, it seems that Western Sydney Wanderers are still suffering from a hangover after winning the AFC Champions League. After a 2-1 defeat at the hands of Perth Glory, WSW has found themselves bottom of the table with no points won after playing four games. Luckily they have two games in hand to play, but you can’t help but wonder (no pun intended) whether the Wanderers can recover from this or not. Before the World Cup, the USA was on top form heading into Brazil winning four of their six games. After the World Cup though, they went downhill as they are now winless in four games after an embarrassing defeat to Rep. Of Ireland 4-1 with bad performances by their defence and midfield gifting them the goals. Before this, the USA lost 2-1 after giving up the lead. The USA has ended the year in a limp after starting it in strong fashion. I don’t understand why there is a need to show unruly behavior in a football game. Croatia’s fans were responsible for showing racist behavior and hurling fireworks to the pitch, forcing Dutch referee Bjorn Kuipers to stop play two times in each half to sort everything out before the game could resume, and spoiled an otherwise intriguing and exciting match between the two front-runners of their group. 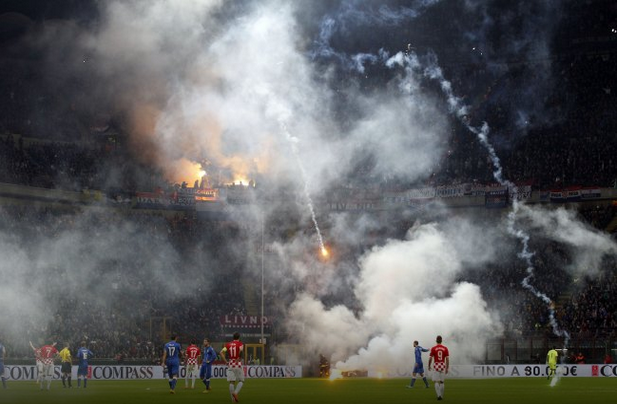 As a result, Croatia manager Niko Kovac and the Croatia FA had to apologize for their fans’ misbehavior at the San Siro. Now they wait for December 11 to hear their fate because of this incident. 100 caps and counting. 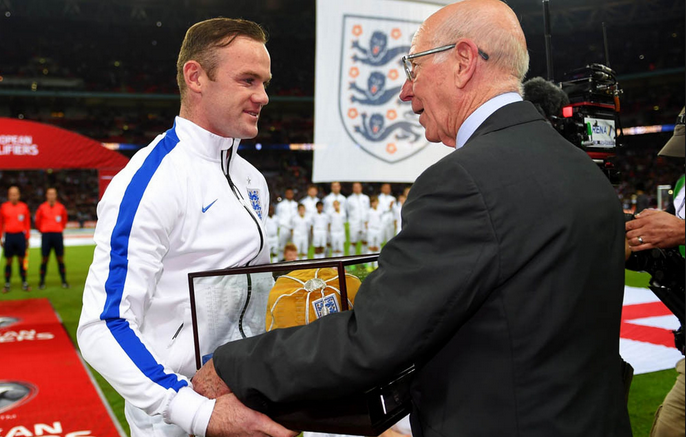 Before the game against Slovenia, Rooney was awarded the golden cap by Sir Bobby Charlton in honor of playing 100 caps for England. Then, he lead the fightback when England was down 1-0 by winning and scoring the penalty to equalize along with a brace for Danny Welbeck, who also has been a subject of scrutiny for his performances lately at Arsenal. However, Rooney was once again proved influential when he himself scored a brace against northern neighbors Scotland in a 3-1 victory, and is now getting closer to breaking Sir Bobby Charlton’s record for being the all-time top scorer for England with 49 goals (Rooney has 46 goals). Even though they lost against Mexico 3-2 before the game against Latvia, they came back in style with a huge 6-0 victory over the unfortunate Latvians. Two goals each from Arjen Robben and Klaas Jan Huntelaar along with goals from Robin Van Persie and Jeffrey Bruma ensured that under-fire Guus Hiddink stayed on as manager after he promised that he would quit if they lose this game. The Dutch are hopeful that this win can kick start their European Qualifier campaign. Japan was under the subject of criticism when they lost 4-0 easily to Brazil and because of a sub-par performance against Jamaica a few months ago. But they silenced their critics when they won emphatically against poor Honduras 6-0 along with a deserving 2-1 win over close rivals Australia as they look set to defend their Asian Cup title won in 2011 in two months time. Tags: Asian Cup, Croatia, Euro 2004, European Qualifier, FIFA, Fire and Ice, football, Greece, Japan, Netherlands, United States Men's National Team, Wayne Rooney, Western Sydney Wanderers. Bookmark the permalink.